"If I would have won one early in my career, maybe I would have never put all the work and the time in that I have over the last 13 years," said Nowitzki as he celebrated the championship that came with his Mavericks' 105-95 win in Game 6 of the Finals. "So this feels amazing." "It's a team that when you view it from afar, it doesn't look like a physically bruising type team," said coach Rick Carlisle of his Mavericks. "So a lot of people don't think we have the grit and the guts and the mental toughness. This is as mentally tough team I've been around." "His view of the game is so different, and he's savant-like," Carlisle said. "He's just been a thrill and a privilege to spend time with." "We just kept playing," Kidd said. "That just shows the character of this team. No matter how old you are, we understood how to play the game, by passing the ball and making sure that we didn't take shots where three or four guys are on you. We just made the extra pass. We didn't care who put the ball in the basket." “I just think we’re a resilient bunch. This whole series we were down some. 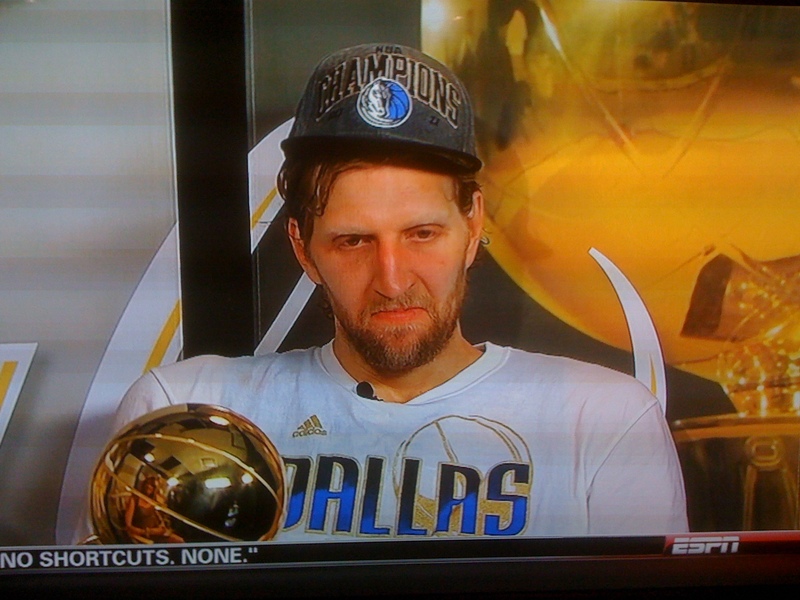 This is a win for playing as a team on both ends of the floor,” Nowitzki said. “We never looked as ourselves as soft. We just kept fighting." Just enjoyed a full four days of the 2011 version of Division 1 March Madness. Great games for sure. And fabulous finishes, at least from a fan's perspective. Oh, the feeling of a winning end of a game-ending play ... or, yuck, the losing end of a play gone bad. The closing seconds of many games today, especially the close ones where plays were made for the best -- or not-made for the worst -- got me thinking: better offense or better defense? 1) With 5 seconds in the game, Washington was down just a point as it attempted to inbound the ball on its own baseline; however the pass was deflected and the ball stolen by North Carolina. UNC went on to sink two free throws and win by 3. The Huskies never got a great shot off because of the difficulty it had with the inbounds play. FACTORS: UNC is ranked 8th in defensive efficiency. UW is ranked 9th in offensive efficiency but had 13 total turnovers, only attempted 7 free throws (made all 7), and shot a lower FG% than the Tar Heels (45.8% to 47%). Carolina shot 78% from the stripe but went to the line 23 times. PRESSURE COOKER: Washington never got a great shot attempt in the end and had trouble scoring in its half court offense throughout, while Carolina did its thing on O and stepped up on D = defense created offense. 2) After being down 15 points midway through the second half, Michigan roared back to challenge Duke. Hardaway, Jr. scored 7 straight to bring the Wolverines to within 1 point with 1:18 left. A Blue Devils offensive rebound off a missed jumper led to an Irving jumper off the glass. Morris scored for Michigan then had to foul Smith with 9 ticks remaining. Smith made the first but missed the second. Morris then missed a running floater in the paint as time expired. FACTORS: Duke's offensive efficiency is ranked 4th while its defensive efficiency is 3rd. Michigan's OE is 29th. DE is 33rd. Duke grabbed 9 offensive rebounds to Michigan's 4. Duke shot 72% from the free throw line while Michigan shot nearly 91 percent - but the Blue Devils went 25 times compared to 11. PRESSURE COOKER: Both teams scored to keep it tight, then Duke missed free throw to pave a 3-point victory while Michigan missed good shot in lane -- non-contested -- to send it to OT = better offense sealed outcome, defense set the tone (Duke's perimeter D from the outset clamped down on Michigan's perimeter-minded attack ... the defensive tone was set but who was going to find openings?). 3) After a series of offensive boards and a made free throw by Williams with 2:01 left, Arizona was tied with Texas at 67 a piece. Brown hit a jumper for the Longhorns with 1:07 remaining and then prevented the Wildcats from scoring for another minute. Texas had possession on the baseline after a timeout, up 69-67. All the Longhorns had to do was inbound and take care of the ball, but they were called for 5 seconds. Arizona inbounded and found Williams off a pick and roll, he scored off a strong take and got fouled in the process. He made his free throw. Texas got a final layup off but it missed. FACTORS: Arizona is ranked 18th in offensive efficiency, 10th in effective field goal percentage. Texas is 21st in OE and 4th in DE -- with a ranking of 5 on defensive eFG%. Zona shot 8 of 14 from 3-point range (57.1%) and had 2 more offensive boards than Texas. PRESSURE COOKER: Wildcat defense stopped Longhorn inbounds play -> big time; Wildcat offense scored on Longhorn defense = defense allowed offense to be created. 4) With the scored knotted at 59 each, Syracuse had control on its own sideline but a miscue with its inbounds pass gave the ball away. Marquette regained possession and made the most of it by nailing a 3-pointer with 27 seconds left. The 'Cuse missed a 3 and Marquette sealed the game with four free throws. FACTORS: Syracuse (no. 3 seed), statistically, is a better team, but on this night 11th seeded Marquette made 19 of 23 free throws (compared to 5 of 7 from the Orange). The Golden Eagles grabbed 11 O-boards to the Orange's 4. Syracuse had 18 turnovers. Marquette beat Syracuse earlier this season, too. PRESSURE COOKER: Marquette got after it and created opportunities with rebounds and steals. Syracuse shot 55.3% from the field but other than that, it lost in every other offensive category = defense created offense ... and offense created offense for Marquette. It's a hodgepodge of plays and stats and ranks. What is influential is how the climactic plays in three games, the ones that swayed the outcomes, came from suffocating defense that prevented great offense. UNC's deflection and steal. Arizona's forced 5-second count. Marquette's coerced backcourt violation. What is striking is all of these key turnovers that led to game-sealing points came from inbounds plays. So, who from these winners has the best chance to win the whole tournament? If data from the last six years is any indication, then none of them. Not Duke, North Carolina, Arizona or Marquette. All signs point to THE Ohio State University. OSU is No. 1 in offensive efficiency. It has only lost two games this year, both in conference, and destroyed its two tourney opponents. The Buckeyes are No. 2 in eFG% and No. 7 in turnover percentage. Defensively, they are No. 6 in defensive efficiency and ranked No. 1 in opponent free throw rate. All of this means good luck stopping OSU and good luck scoring on them. Even attempting a foul shot is difficult. Wisconsin is a slim possibility because of its No. 2 OE and No. 1 TO%. Duke has an OE at No. 4 and a DE at No. 3. San Diego State is No. 2 in DE and No. 7 in opponent eFG%. The overall deciding factor: of the last six D1 NCAA champions, four of them finished the season ranked No. 1 in offensive efficiency: Duke (2010), UNC (2009), Florida (2007), and UNC (2005). The other two years of the previous six? The champion was 2nd in offensive efficiency: Kansas was No. 2 in in 2008; Florida was No. 2 in 2006. Additionally, the 2008 Jayhawks, though not first in OE, were No. 1 in defensive efficiency and No. 5 in eFG%. The 2006 Gators were No. 5 in defensive efficiency and No. 2 in eFG%. The last seven NCAA winners finished with an overall rating -- offense and defense factors combined -- of at least No. 2 (FIVE were No. 1 overall). Lesson: if you are not No. 1 in offensive efficiency, then you better be No. 2. And if you happen to be No. 2, you better have a ranking of at least 5 in another significant category to raise the overall stat. Otherwise, you'll lose ... if you are lucky enough to get to the championship. Of the runners-up in those six years, none had a ranking of 2 in either offensive or defensive efficiency. Plenty of 3's and 4's though. Taking 2004 and 2003 champs into consideration, it looks like the second half of the decade has gone to the teams at the very top of the rating system. Connecticut won in 2004 with an OE ranking of 4, a DE of 5, and an OBoard% of 3 ... so, three categories were a No. 5 ranking or better but none at Nos. 1 or 2.